~~I disappeared there for a while. Didn't mean to. Life has just been so busy these past few days. It seems that when things get really busy, my normal routines slide out the window. I don't really like that but sometimes it can't be helped. ~~Thursday was a going-away party for my grandparents. They run a camp in Ontario Canada during the summer. We always hate to see them go because we miss them so much. But this year we're planning on going up for a week during the summer. Yay! ~~Friday I had to take Savannah to the doctor again. She's having some major digestive problems. We're afraid that it's related to her food allergies but aren't sure. My poor baby hasn't been able to keep much food down for several weeks now. The doctor has us trying a few things but if it doesn't get any better we'll probably be back in this week. Please say a prayer for her if you will. 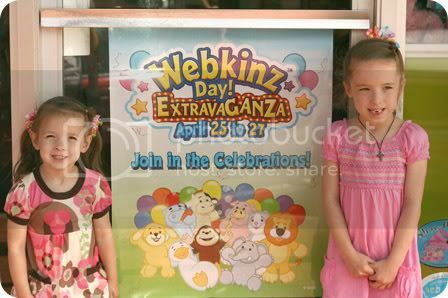 Friday was also Webkinz Day Extravaganza, something my girls were extremely excited about. Face painting, prizes, and new Webkinz. If you have little ones than you probably know what I'm talking about, lol. ~~Saturday was an event that I look forward to all year: The Festival of the Arts in Oklahoma City. It's a big, big event. Every type of art you can imagine is there; visual arts, sculpture, woodcarving, pottery, glassblowing, photography, performing arts....you name it. It's such a neat experience to be able to see so many different types of art all in one place. I got to meet and visit with Carla Sonheim. She was so sweet and it was nice to put a face to an online friend. The girls are big fans of her work and they "oohed and aahed" over each piece. One of the biggest draws of the festival is the "International Food Row." Honestly, that's the reason that most people come, lol. The food is amazing. I think it's a great idea to pair unique and delicious food vendors with the arts festival because it draws in people who normally wouldn't come. My favorite thing this year? The huge piece of frozen cheesecake, dipped in chocolate, drizzled with caramel and rolled in nuts. Yeah. Probably filled my daily calorie requirements in that one dessert but it was so worth it! 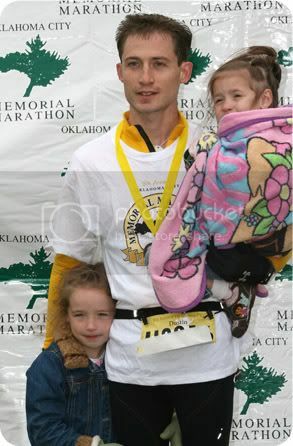 ~~Sunday was the Oklahoma City Memorial Marathon. No, I didn't run and yes, shame on me. I've fallen out of a regular training routine and then I had a foot injury a few weeks ago. But I'm going to get back into it. I promise! Dustin ran the half and the weather was horrible! Saturday was a gorgeous, sunny day but Sunday was cold, windy and rainy. The girls and I stayed inside at a church that was hosting a pancake breakfast and had big screens up with the race broadcast live. Then we ran outside and waited for about 20 minutes until he finished. The girls had jackets, blankets, gloves and earmuffs and were still freezing. Dustin did awesome! He finished 68th overall (Out of 4,354 people) and 7th in his age division. ~~Whew! I think we're up to date now. This week is already looking busy. (Is it really Tuesday already?) Hope everyone is having a good week. Guess I'd better run! Whew! That is a lot! I'm with you on being more committed to running. I've fallen so far behind and want to catch up!! I would love to go to an art festival. I haven't been in so long but I used to love going to Main Street Art Fest in Ft. Worth every May. Kasie, life has certainly been hectic for you. I just read your most recent post about Savannah and will be praying for her. My hope and prayer (apart from her being well again soon) is that you can get some answers, so that she can be treated accordingly and relieved of the vomiting. The festival of arts sure does sound like an awesome experience and that cheescake would have been fabulous. Congratulations to your husband as well for his efforts in the marathon.